Curious, playful and manipulative- these are just of the several attitudes and behavior that our child apprehends as he/she develops not only his visual and auditory acuity but also the cognitive aspect and basic concepts. They tend to be so active and bursting with energy that you, as parents should watch your little one’s growing state. 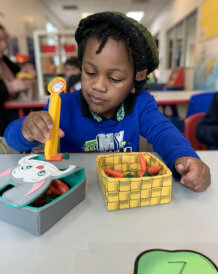 Here at Grow Smart Children’s Academy, we support your child’s beginning steps for growth and development thus, providing those educational age-appropriate materials and wide-ranging experiences to help them understand things in their surroundings like shapes, size, movements, symbols and sounds. Parents like you, can also be guided with our tips and guidelines about Parenting and child care, because we highly acknowledged how important your roles are in the family. It is our responsibility to give them safety, provision, security, and the best education. Hence, it is the initial step to be attached with our kids and be able to feel our trust, care and love for them. Be part of our fun and interactive Day Care Program!